BOSTON, April 4, 2018—The 29th annual Bayard Rustin Community Breakfast, a spirited celebration honoring the roles lesbian, gay, bisexual, and transgender (LGBT) people of color have played in the fight against HIV/AIDS, will take place Saturday, April 7 from 9:30 a.m. to 12 p.m. at the JFK Presidential Library and Museum, Columbia Point, Boston. Admission is $25, however, no one will be turned away due to an inability to pay. The event will include a keynote address by Bisola Ojikutu MD, MPH, an assistant professor of medicine at Harvard Medical School (HMS) and associate physician within the Division of Global Health Equity at Brigham and Women’s Hospital. Dr. Ojikutu is a past honoree of AIDS Action Committee’s Hero in Action Award, which recognizes those who have been significant contributions in the movement to end the transmission of HIV. She maintains an active clinical practice focusing on the treatment of HIV, primary care and general infectious diseases. She has also worked throughout sub Saharan Africa developing and evaluating models of care for people living with HIV. Her research is focused on impact that social determinants of health such as poverty, discrimination, and immigration policy have on HIV transmission, clinical outcomes, and barriers to accessing care. This year’s breakfast will honor Allan McClendon with the Bayard Rustin Award for Courage. Named for Bayard Rustin, an openly gay, African American man who was the key architect of the 1963 March on Washington during which Dr. Martin Luther King, Jr. gave the “I Have A Dream Speech,” and who worked closely with King in the political movements for social justice and civil rights, the award is given annually to a person of color who has shown courage in advocating for people living with HIV/AIDS. After growing up in the Illinois foster care system, McClendon survived a devastating fire in his apartment building in 1987 only to receive an HIV diagnosis while being treated in the emergency room that night. At that time McClendon was being pressured by his Pentecostal church community to renounce his gay identity. Having lost his home, his possessions, and newly diagnosed with what was, essentially, a death sentence in 1987, McClendon believed God was punishing him for being gay. He left the Pentecostal church and slid into substance addiction, which was further fueled by the loss of many of his loved ones to HIV/AIDS. McClendon eventually recovered and joined the Metropolitan Community Church (MCC), an LGBT-affirming denomination that inspired him to use his experiences as a gay, Christian, HIV-positive man to help others. In addition to being an active lay leader with MCC Boston, McClendon is a member of the Boston Living Center (BLC) and AIDS Action Committee (AAC) and served two years on the Boston Department of Public Health EMA Ryan White Part A HIV Health Services Planning Council. He is now studying for a master’s in pastoral studies at Andover Newton Theological School (ANTS) and interns as a student pastor with the Common Cathedral (CC) street ministry where twice weekly he provides pastoral care, leads worship music, preaches, and delegates hospitality. Larry V. Day, the program director of Victory Programs’ Boston Living Center, will receive the Belynda A. Dunn Award for Activism, which is named for the beloved activist and former AAC staff member who contributed greatly to the fight against AIDS and related illnesses in Boston. Day, who is HIV positive, overcame decades of substance use as well as a period of incarceration to dedicate his life to HIV education and prevention efforts in his community, becoming one of the most visible and vocal advocates for people living with HIV/AIDS and/or Hepatitis C locally and nationally. His work has included serving on the board of directors of Victory Programs and 15 years on the Ryan White Planning Council, including four as Council Chairperson. The Bayard Rustin Community Breakfast will also feature performances by the actor/singer Gordon Michaels, and cellist Sam Ou. The sponsors of this year’s breakfast are Gilead, Gourmet Caterers, Fenway Health, American Heart Association/American Stroke Association, Babson College, Bentley University, Beth Israel Deaconess Medical Center, Victory Programs, Brigham and Women’s Hospital, and Edge Media Network. The Bayard Rustin Community Breakfast is named after Bayard Rustin, an African American gay man who worked closely with Martin Luther King Jr. in the political movements for social justice and civil rights. The Breakfast strives to reflect Rustin’s activism, humanitarianism, and artistic ideas by creating a multicultural, spiritual, and educational celebration that recognizes the roles of lesbian, gay, bisexual, and transgender (LGBT) people from communities of color in the fight against the AIDS epidemic. 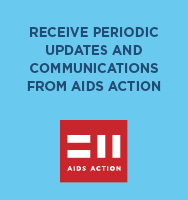 AIDS Action Committee of Massachusetts is New England’s largest provider of services to people living with HIV/AIDS and populations at risk of infection. AIDS Action leads the state’s Getting To Zero Coalition, which seeks to reduce the number of HIV infections to zero and operates a needle exchange that serves as an entry point to healthcare services for active substance users. In 2013, the AIDS Action Committee of Massachusetts became a part of Fenway Health, which works to make life healthier for the people in our neighborhoods, the LGBT community, people living with HIV/AIDS and the broader population.